A few weeks ago a bomb was dropped. My Tuscan husband, the can’t-live-without-bread, pizza-loving, pasta-making man that he is, was told he has a severe intolerance to wheat and that he’ll need to cut it out, cold turkey. Needless to say, when your partner or someone in your family has to change his or her diet, it pretty much means that the whole family change their diet, unless you want to cook separate meals to cater to everyone’s needs – I don’t, personally, I find it hard enough some days to get time to cook one meal! I’ve heard a similar story happen to so many, including some of my favourite bloggers like Emma Galloway from My Darling Lemon Thyme, whose beautiful new cookbook (entirely gluten-free) has been a revelation and a wonderful source of inspiration – I’ve already made her brownies three times and the bánh xèo (crispy Vietnamese pancakes) have made husband a very happy man. We did quite a bit of experimenting at home as it was very difficult while in Tuscany to eat wheat-free and practically impossible to grab a quick breakfast or a snack while out and about (unless it was cecina or torta di ceci, a delicious chickpea crepe found on the Tuscan coast and some Florentine bakeries). 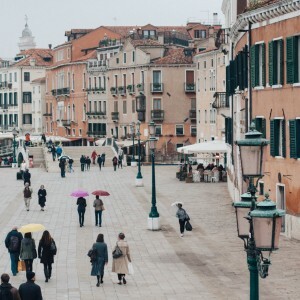 While gluten intolerance is a relatively new concept in Italy, gluten-free pasta and pizza bases (the ones we tried were terrible, however) are available in some restaurants and are now easy to get in the supermarkets. It was easiest, however, to get by without eating wheat by simply avoiding it altogether, which means foregoing pizza, picking risotto over pasta and polenta over bread, for starters. I have always loved polenta in all its forms – cooked softly until creamy like mashed potatoes or set hard to slice and grill to use like bread for crostini. 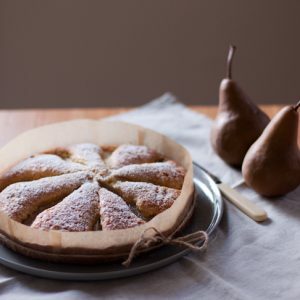 It’s also a favourite ingredient of mine to use in baking in place of regular flour, like in this pistachio and polenta cake or these polenta and elderflower cookies. This recipe for polenta crostini is so versatile and very handy if you need to prepare some gluten-free antipasti. 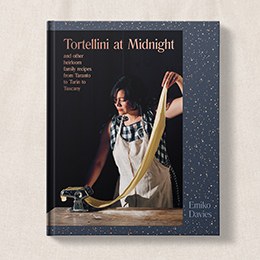 The hard work goes into preparing the polenta, but once it’s cooked and set, which you can do well in advance, you only need to briefly grill, bake or fry the polenta slices before topping with something simple. As with regular bread crostini, you can use just about anything. This mushroom topping is particularly Tuscan. It’s a lovely autumnal dish, incredibly simple and tasty, but other classic toppings for polenta crostini are ragu (which makes for a hearty meal of its own) or baccalà mantecato (whipped cod) for a bit of Venice on your plate. This recipe first appeared in print in The Canberra Times Good Food section. To prepare polenta for making crostini, you need a slightly higher ratio of polenta to water than you would for a soft polenta and a coarse-ground meal such as bramata. Fioretto, a finer grind, is best for a creamier, soft polenta or for baking cakes or biscuits. There’s also instant polenta, which is partially-cooked then dried again and takes just minutes to prepare but what you make up for in time, you’ll sacrifice in flavour – but it’s not bad for those times when you quickly want to make a polenta that you will then grill, bake or deep fry such as for these crostini. To prepare the polenta crostini, cook the polenta with the water and salt in a large non stick saucepan over gentle heat for about 30-40 minutes to create a very dense, very thick polenta. Use a wooden spoon to stir often – it may help to have another set of hands to take over when your arms get tired. If the polenta starts making big bubbles turn the heat down to the minimum or remove it from the heat for a minute. When cooked, remove from the heat and transfer the polenta to a large casserole dish or baking tray greased with olive oil. Quickly (as it sets fast), press the polenta down with a silicon spatula, or if it’s not too hot, with your hands, spreading it out as you go, until it is about 2cm thick and relatively smooth on top. Let cool completely. Once set, cut the polenta into rectangular slices about 7×5 cm. Place them on a baking tray lined with baking paper and bake at 200ºC until they are golden and crisp on the outside, about 20 minutes. Alternatively, you can brush them with a bit of olive oil and then grill or barbecue them until golden. In the meantime, prepare the mushroom topping. Remove the stems, clean the caps gently of any dirt with some kitchen paper and slice thinly. Squash the garlic cloves with the back of a knife and saute the mushrooms and garlic in the olive oil and butter until the mushrooms are soft and cooked. Remove the garlic cloves, add fresh herbs and season with salt and pepper. Top the hot crostini with the warm mushroom mixture and serve immediately. Thanks Sneh! It is indeed a good combination, I guess that’s what makes it a classic! I’m always making lists of gluten-free recipes in my head because I have plenty of friends who asks for options. I generally do as you’ve done here – find traditional recipes that uses grains before the standard wheat bread was introduced. Banh Xeo is wonderful because I grew up eating it! Good luck with the new recipe hunt. I’m with you, I prefer the traditional recipes that don’t require messing around with lots of different flours and ingredients, though I’m starting to see now how much my husband misses regular bread and pizza etc why those recipes are going to start becoming important! Plenty of experimenting to come! Thank you for sharing a great idea for polenta and giving me some inspiration! I have always wanted to try polenta and I think this recipe would be perfect. Good luck! I do think that grilling these is the best result but baking is very easy and gives a very crisp result. Hope you enjoy them! Oh Emiko, so sorry to hear your husband was diagnosed with food intolerance! However what you do for him is great. I am not a polenta fan myself, but these crostini look very promising. I’m sure the tastes combine really well! I haven’t tried them, but La Tartine Gourmand has a lot of gluten recipes for desserts that look great. Meanwhile your polenta and mushrooms looks mouthwatering! Yes, you’re right! I do have her cookbook too and must get around to trying some of those out! If you need further motivation to give up the evil gluten there is a free online series right now. One of today’s speakers is Tom O’Bryan on Gluten’s effect on the brain, thyroid and body. I’m convinced that even if you don’t have a recognizable gluten intolerance (or a very obvious allergy! ), you are better off without it. I’m grateful for your recipes! http://www.thethyroidsummit.com (totally free, no spam, but each day’s speakers only lasts for that one day so it’s time sensitive). 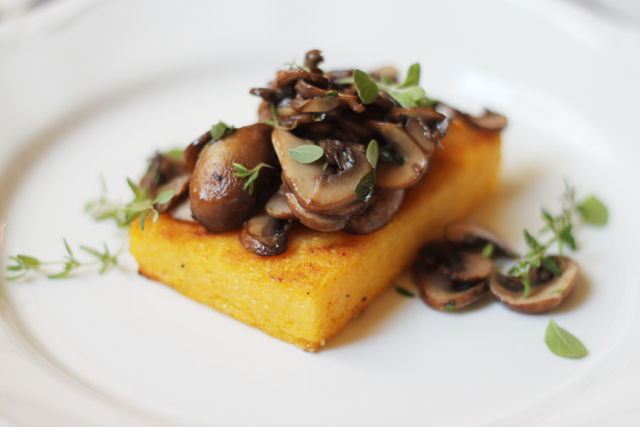 Would you please give the polenta w/mushroom with US measurement. Thanks…..
Hi Ann, for the polenta you need 4 cups of water and 10 ounces of polenta. Then 1 pound of mushrooms and 1 tablespoon of butter. For future reference, there are many very handy recipe measurement converters online that can do this in a flash for you, this is an example: http://www.convert-me.com/en/convert/cooking/ Hope that helps! 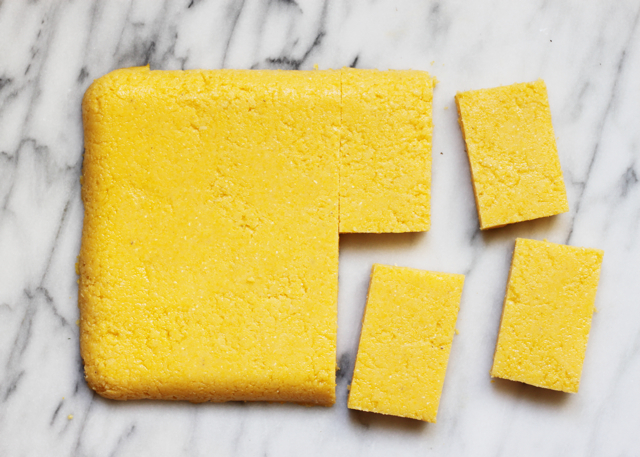 I love how polenta is such a simple, straight forward, gluten-free alternative. Many gluten-free recipes can get very complicated by trying to mimic the consistency of bread or pasta. Polenta, water and a pinch of salt is all you need in this case! 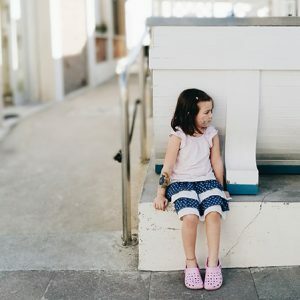 These photos are absolutely gorgeous, Emiko! I do enjoy polenta made this way and now I must go out and find some coarse ground polenta. I’m sorry for your husband not being able to eat traditional pizza and pasta, but I’m interested to see how this inspires your cooking going forward. Oh no! Poor Hubby, and you as a consequence. I am luckily not intolerant but gave up carbs for four months (from Jan to April) and am still eating very few. I wanted to shed some extra kilos and learn to eat in a more healthy and nourishing way. 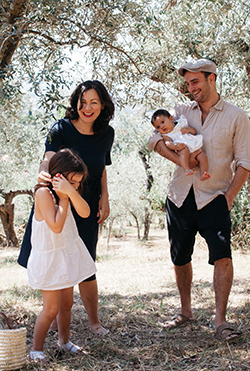 It was really tough at the beginning, especially living here in Italy, and sometimes I make separate meals for the kids and husband (although not that often, I often barely have time to make one meal, as you said). In time, however, it gets easier and the less carbs I eat, the less I crave them (and sugar) and the longer I stay full. So all in all, it is a much healthier way to eat and I feel better than I have in a long time. We have been eating lots of legumes, rice (well, not me! ), quinoa and experimenting with all kinds of cereals. And often, when I do indulge in a plate of pasta, it is farro pasta, and if I eat bread it is usually never white or over-processed flour. It certainly forces us to consider new ways of cooking. 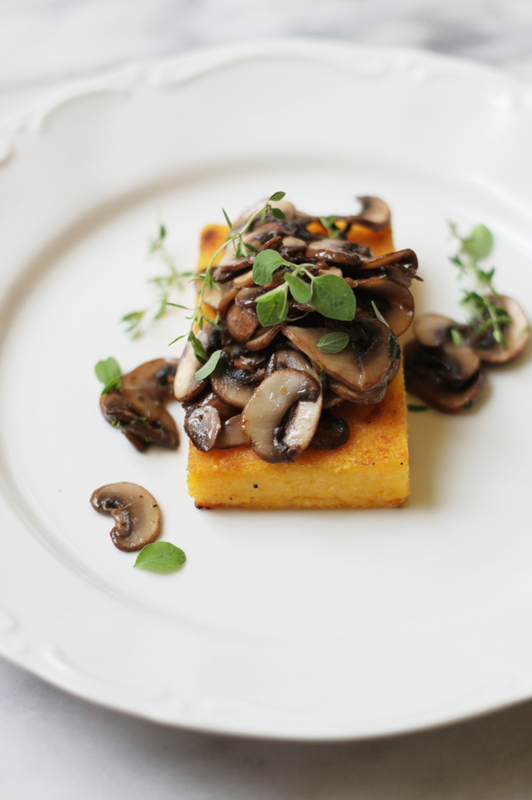 Look forward to seeing what other delicious recipes you come up with, besides this lovely polenta! In just a month of not eating wheat, my husband has already lost 4 kilos! Not that he was planning on losing weight but it does say something! Friends who have families that have been living gluten free for a while now often say it’s probably something we should all eat less of and I’m now starting to see why. And yes, you’re right, I am enjoying too the challenge/excuse to explore new ways of cooking! 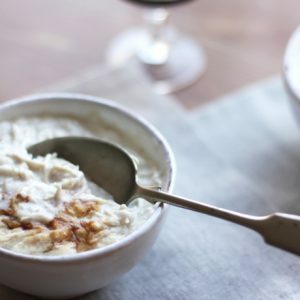 Going gluten-free can be really challenging, but thankfully we live in a time where you can find loads of great gluten-free recipes with just the click of a button! These crostini look lovely and totally satisfying. I can’t think of a worse thing for an Italian to have to deal with than being gluten free, but by the looks of that polenta, I think you guys’ll manage just fine. Looks mighty delish with all those mushrooms just spilling over like that. Mmmm! I know, it’s bad, right? And worse because in Italy they seem to be relatively “behind” on the whole gluten-free front. It’s getting better slowly but it’s not like what you can so easily get in Australia and the US, for example. But as you say – there are lots of great, traditional options like this polenta, or buckwheat or chestnut flour, that make it all easy!